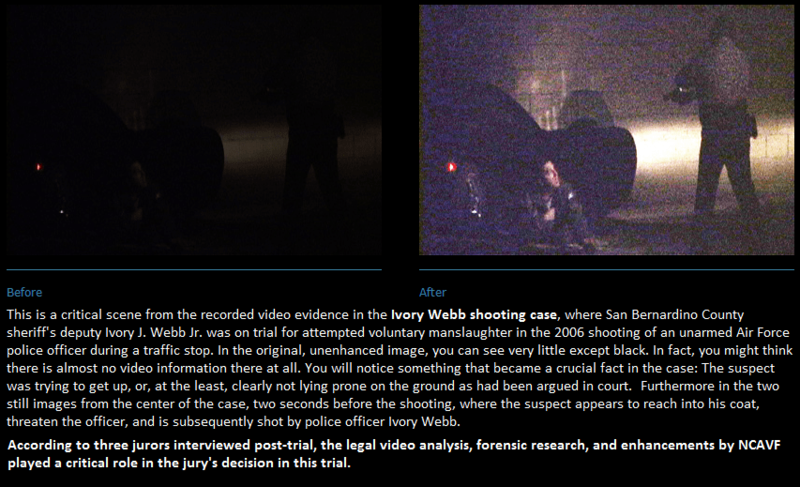 Recorded footage is often used as evidence in court. Videos and Imagery can be captured from a wide range of media recording devices, like Body Cameras, CCTVs, in car cameras, smartphones, camcorders, webcams and other similar devices. In addition there are surveillance cameras recording all our activities at ATM machines, airports, shopping malls and other public places such as roads and public transports. It is recorded footage from these devices that are often used in court investigations. They help in interpreting the intent of a crime and in pinpointing the actual criminals as well. However, quality of the footage is of utmost important in such proceedings and can mark a turning point in criminal cases. Due to a wide range of reasons such as, abrupt weather conditions, bad lighting, limited camera ability, distance, angle or recording speed, a surveillance footage might be inferior in quality and cannot be used as evidence without proper forensic video enhancement. Noise Reduction & Video Denoising – There are various factors like noise, blur, blocking and other compression factors, that occur at the time of video acquisition and negatively impact the quality of digital video sequence. Noise Reduction and Video Denoising is a complex process of removing noise from a video through image restoration mechanism of a degraded image. The process aims at reducing noise through a frame of images and between the frames as well. There are various complex methods used for Noise Reduction & Video Denoising. Tone Mapping – Tone mapping is used on low light videos by mapping a set of colors and approximating them with a high illuminated video. This technique is applied on brightness level i.e. luminance. The main premise behind Tone Mapping is to match the brightness of an actual scene and reproduce that in any video or image. Tone mapping is used in the field of Forensics for digital video brightening. Histogram Equalization – Histogram Equalization is a contrast enhancement technique aimed at improving images and videos with low contrast due to insufficient light. Histogram plots grey level of pixel on a scale of 0(black) to 255(white). The main goal of Histogram Equalization is to uniformly distribute the pixel values by enhancing the grey component. NCAVF, the National Center for Audio and Video Forensics, is an advanced audio and video forensics company. It is a leader in video enhancement services and preparing media for evidence used in mediations, arbitrations, hearings and court. Their expertise is 3D recreations of crime scenes to video production, and from forensic video enhancement to testifying in court as an expert witness. Mr. David Notowitz operates NCAVF. He is an Emmy award winning producer and multi-faceted video and audio forensic evidence expert. NCAVF is on the Panel of Expert Witnesses of Los Angeles County Superior Court, the Los Angeles Public Defender’s approved experts list, and on numerous public defender lists throughout California. Some of their largest clients are Target, Kroger, Stater Bros, State Farm, Home Depot, and McDonalds.